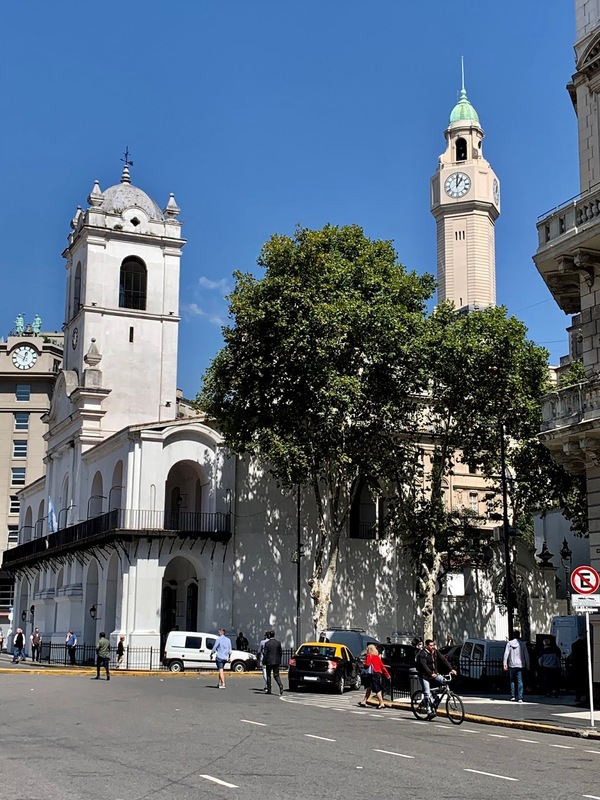 When we arrived at noon to the Plaza de Mayo - once a meeting place for sailors and merchants - workers with blue shirts were protesting. I find inspirations every time I travel. Please visit my web site to learn about my art. Not being able to exchange money at the airport and not being able to resist the pastries in a patisserie we asked if they would accept credit cards. They had a minimum equivalent to about 10 empanadas but they told us that to exchange money you have to listen to people calling cambio-cambio-cambio. So we listened. Soon we heard a young girl. She took us to a narrow door on the back of a newsstand. When I asked she said shyly that it was actually illegal in that part of the city. So one has to learn to listen to survive in Buenos Aires. 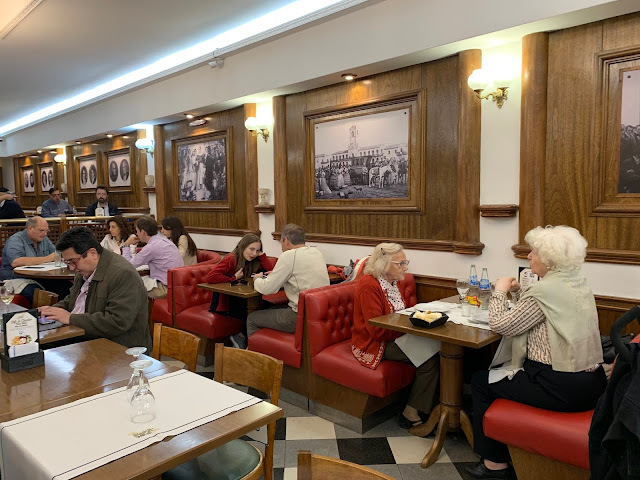 Cheese loaded “pizzas con fainá” were being served in La Junta restaurant built in 1810. Fainás are traditional garbanzo pancakes, a result of Italian originated chefs being all around the country. An old man was having coffee and reading his newspaper and two chic ladies with silver hair were having concentrated conversations over tea. We then visited a contemporary exhibition at a museum and an exhibition called “Los circulos del Dante” at a two-story house owned by the previous president Don Bartolomé Mitro. Such exhibits are mostly free and ideal getaways from the busy streets of the city. Buenos Aires is full of graffiti and fileteado style displays. In the elongated lights of afternoon we walked around Plaza Dorrego where locals were having wine and beer with peanuts. A former station for carriages, this cobblestone square is in San Telmo barrio, which was the residential district for colonial officials between 16th and 19th centuries. 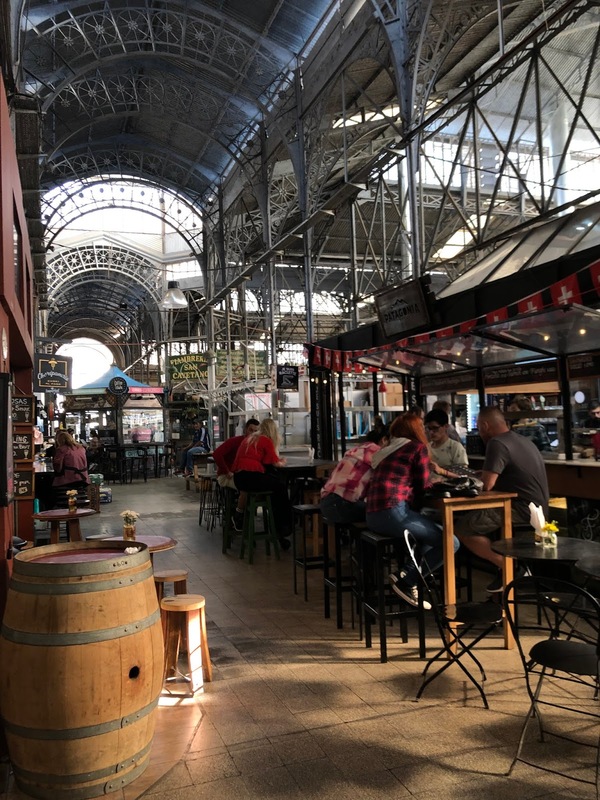 In the Mercado Centermo - an arched market hall with small cafés and shops, we learned about Yerba mate from a tea seller. This tea which a lot of the locals consume on a regular basis is grown in the Misiones region by the Iguazú falls Region near the border between Argentina and Brazi. It is drank with a calabash gourd -a metal straw that has a filter at its end. We then had a traditional potato omelet with Malbec wine across from a doll shop with low rays of the sun finding ways to get in from high windows. Then under the cool shade of old trees we had more Malbec with pigeons trying to eat shelled peanuts from the tables. Two couples of professional tango dancers waited their turns to dance on the two dance floors in the middle. Then a woman with a yellow curly wig sang while an old gentleman accompanied her dancing. 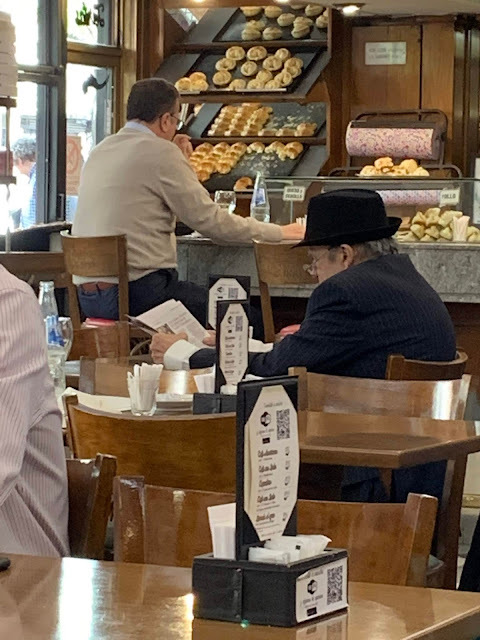 Inside the Plaza Dorrego Bar from 1880s - a previous grocery store walled by dreamy mirrors, an old man was sitting enjoying a beer, while the church chimes were announcing 6:30. In the morning, we flew from Buenos Aires to El Calafate, located on the south side of the Lago Argentino, the largest lake in the country. Founded in 1927, the town now has 7,000 inhabitants. Surrounding this small town is the Patagonian steppe covered by drought tolerant low bushes. The road to the Glaciar Perito Moreno from El Calafate first traverses through this landscape in colors of mustard yellow then enters a forest with lenga, ñire, and guindo trees. Many birds of prey like the southern crested caracara, brown chested buzzard and American kestrels were perched on dead ñire trees overlooking the arms of the lake Argentina. The road ends at Puerto Bajo de las Sombras on the Peninsula de Magallanes with stunning views of the Perito Merino Glacier, one of the 47 major glaciers spilling from the Southern Patagonian ice field. Under their tremendous weight, heavy snow storms of the Pacific in the Andies recrystallized and formed these glaciers. We took a ferry to approach the massive walls of the 130 km long glacier at places 70 m high. Dripping sounds of melting ice is was only distracted by falling pieces sounding like thunder. Otherwise it is all quiet. In the forest on the peninsula, catwalks run in a forest of ñire trees and the scarlet red fire-bush notro. After a splendid dinner at Pura Vida where home made Argentinian stews were served in clay dishes we spent the night in a lovely hotel called Hosteria Los Canelos. The following morning, we started the day searching for birds at Sendero Laguna Nimez at the edge of El Calafate. It was a cold serene morning. A gray fox showed itself for a few seconds before disappearing among the tall grass again. Blue beaked Andean Ruddy-ducks and red shovelers were hanging out closer to the shore. Coscoroba and black-necked swans were farther away. Upland goose, southern lapwing and red gartered coot were quite common. We also saw many rufous colored sparrows called chingola, long-tailed meadowlark with scarlet red breasts, an Austral Pygmy owl and a number of Patagonian mockingbirds. We then traveled to south through a high plateau covered with a flora of coiron and mata piedra, typical flora of the steppes. Guanacos were grazing peacefully together with long haired lesser Rhea, the birds that can not fly similar to emus. Along the roadside, many animal carcasses were spread out on the vast land ending with clouds. We stopped at a small dusty town called Esperenza, the last stop for gas before entering Chile except for a small one closer to the border, where the gas prices were much higher. Sheep in colors of soft grey started to appear. Glowing in patches with the low sun, the land now ended with tall dark mountains. After passing through border control at Cerro Castillo in Argentina we went to the border control office in Chile. When the Chilean police realized that they forgot to put a separate custom stamp back at the Argentina border we had to drive back 7 km along with hitchhikers we picked up - a couple traveling from the southern Argentina all the way to Columbia. As soon as we entered Chile, the landscape changed to dark green bushes and trees from the mustard colors of the north. Then the magnificent towers of Torres del Paine started to show itself. The mountains I wanted to see for long. The name means Towers of Blue in native Thuelche language. Thuelche speakers were nomadic hunters who occupied territory in present-day Chile. In the deep valleys of the mountains, glaciers were dancing with clouds in shapes of dragons overlooking the Rio Serrano. We arrived late to Rio Serrano where we would stay, a large lodge like hotel. In the morning after registering at the park headquarters we drove to one of the trailheads to see the towers close by. On the way we took a guide who was hitchhiking to get to his meeting place. He told us that in the south, Argentinians and Chileans get along well. Once, the whole Patagonia of 2 million hectares were owned by 2 families raising cattle. This lasted until 1970s. Now People go to Argentina to work at coal mines, still peaceful. We asked him about the legend on eating Calafate berries (a type of blueberry which grows in Patagonia during December and January). He told us that the legend of eating these berries in order to return to Patagonia was true. in the old days people used to move around to find food. An old woman, after moving from one place to another with her people for many years decided to stay in one place. 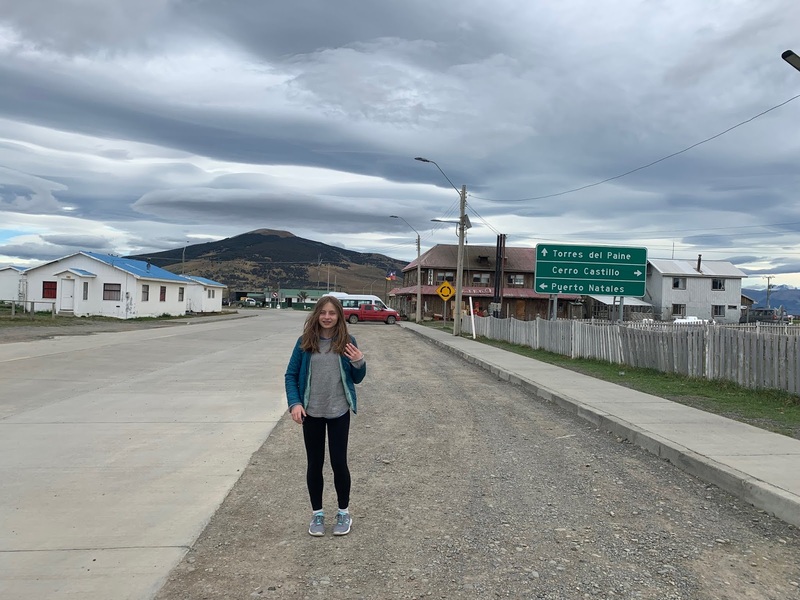 One day she turned herself into a calafate bush so that her people would eat the berries and stay. Another common bush around is mother in law pillow which is quite spiky and pretty prevalent - he told us smiling. The Torres del Paine consist of three different colored layers formed by a series of magma intrusion. The bottom layer includes sedimentary and metamorphic rocks in dark tones which was formed by pushing magma 12 million years ago. Above this layer is a light grey section formed by ice carving the granite. The top is the 130 million year old black clay layer. Three fires in the park’s history ruined some areas which are still recovering. A Chinese guy who was smoking, a Check guy cooking in a forbidden area and an Israeli guy who burned his paper napkins had started them - the guide told us. We hiked from Mirador Salto Grande to Mirador Cuernos with magnificent views of the Torres del Paines; Cuerno Principal, Cuerno Norte, Cuerno Este, Máscara, Hoja and Espada. In some valleys wind was powerful enough to sweep babies off of their mothers arms. I wanted memorize the shapes of each tower, it was impossible with all the crevices and changing shapes. At the top of the Cuernos mountains is the French glacier dripping in places forming lace like lines of ice. 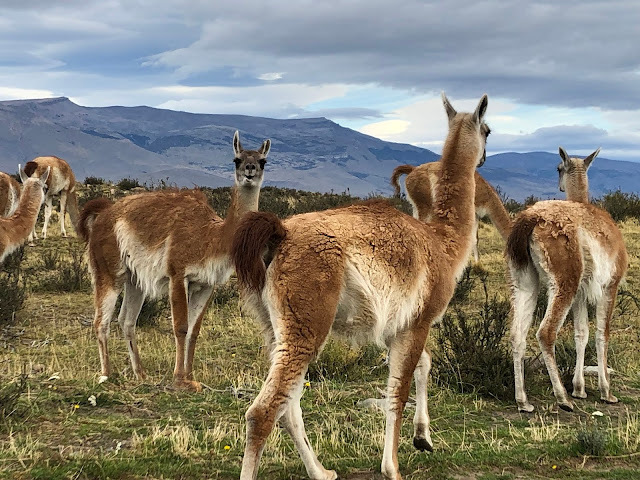 On the hills along the path are many guanacos. We played un deux trois with one of them with my daughter while trying to take his picture with mountains in the background. We were walking when he was grazing and freezing when he lifted his head quickly while looking at us. 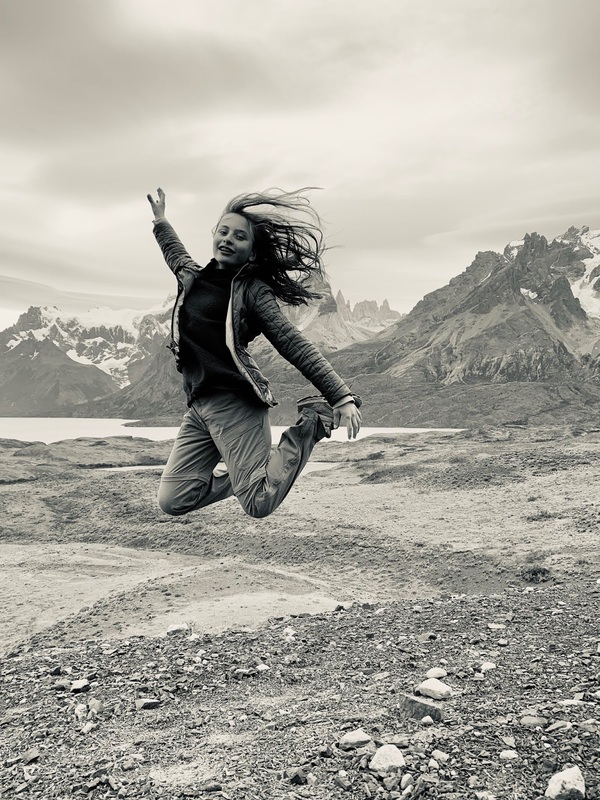 After this 3 hour hike, we walked for another two hours on a black sand on a land between two lakes in mind-blowing winds to see the amazing flow of the glacier in to the Lago Grey where 130 million years old fish fossils were found. The del Paines turned into tones of red at the time we finished our hike and returned to our hotel for a small, but delicious dinner. The next day, we hiked to see the Las Torres which are the towers hidden behind the Las Cuernos mountains. They look like the teeth of a dragon. On the way back we stopped in many small lakes to watch water birds. Speckled teals, red gartered coots, Chile wigeons , and white-tufted grebes were sharing the swamp-like waters of a small lake. Three flamingos were swiftly moving around showing their large red feet in the shallow waters in another lake. To finalize the day we climbed a hill covered with mother-in-law bushes to see the towers one last time. We rested our muscles tired from the day’s 16 km hike with another magnificent dinner with lamb and red wine, compliments of the hotel. The next day, it was hard to leave the towers we have been gazing at for the last 3 days. We had named some of them and had written stories for them. We had 8 hours to drive from the Torres del Paine south end of the park to El Chaltén. Roads are never boring with lots of animals to see and the audio books we download from the library. We listened to Kazuo Ishiguro’s “When We were Orphans” this time. At the border we had to get the same stamps at each country’s border office again. In addition we were stopped by the Argentinian police as a routine check. 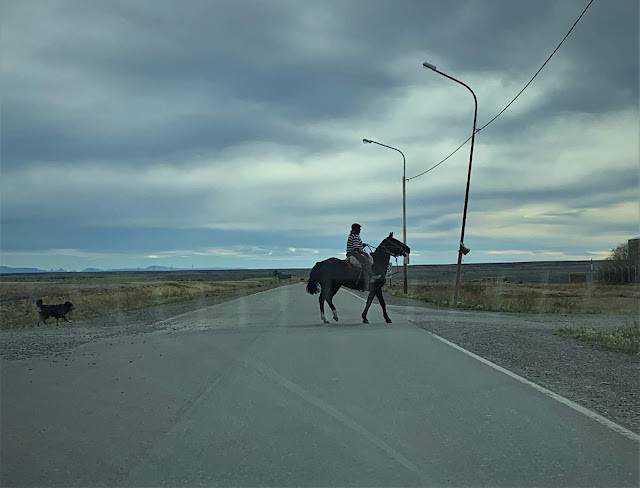 A gaucho were passing the main street on his horse and a dog. In a lake two flying steamers ducks close to the shore were enjoying the view. On a lookout on a hill, three grey foxes (zorro gris) came by and without minding us being close took fox-naps here and there under the bushes making little whiny sounds. For some reason they were pretty comfortable even though we could even see the color of their eyes. Children were playing in the park in the center when we arrived later in the afternoon to the town of El Chaltén, a town established in 1985 as a guard town to resolve a border dispute. Now a small town with 500 habitants has a number of good restaurants and many hosterias. 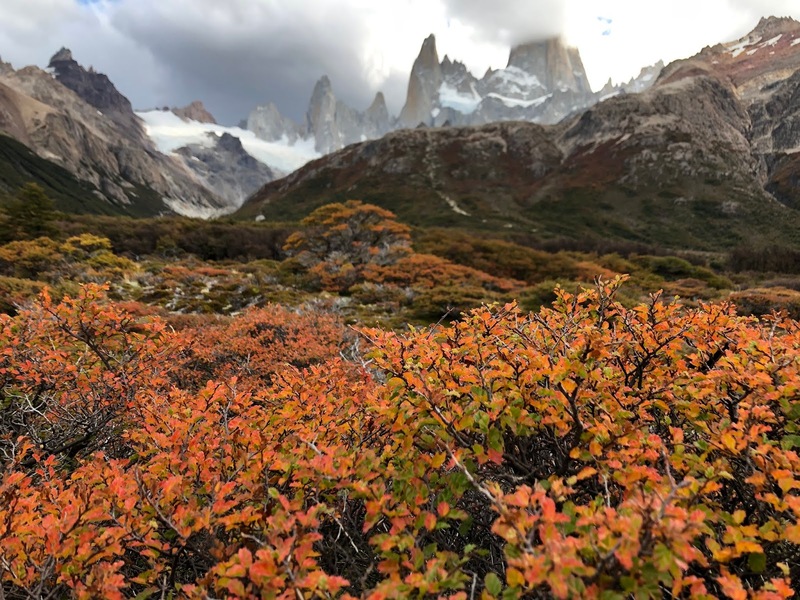 El Chaltén is the entrance point for Parque Nacional de Glacier de Norte, home to the challenging mountains of Mount Fitz Roy and Cerro Torre. Our hotel Hosteria el Pilar was 18 km north of the town. It is an small welcoming home-like hotel run by friendliest managers that we have come across, Cristina and Guillermo. Next day we climbed the Sendero Laguna de los Torres. The trail starts from the hosteria and the path first goes through a ñire forest where we saw a Magellanic woodpecker who was pecking a dead tree too busy to notice us. Then we reached a higher plateau with taller guindo trees home to thorn tailed ryaditos, black chinned siskins, and Patagonian sierra-finches, Austral blackbirds, and white throated tree runners. Low red bushes of indicating autumn were filled with dark faced ground tyrant birds and many black caterpillars. At the top is the fascinating Lago de los Torres beneath the Mount Fitz Roy. Another 10 min walk leads to the Glacier Rio Blancas. After this 23 km hike we were again warmly welcomed by the managers of Hosteria Pilar. 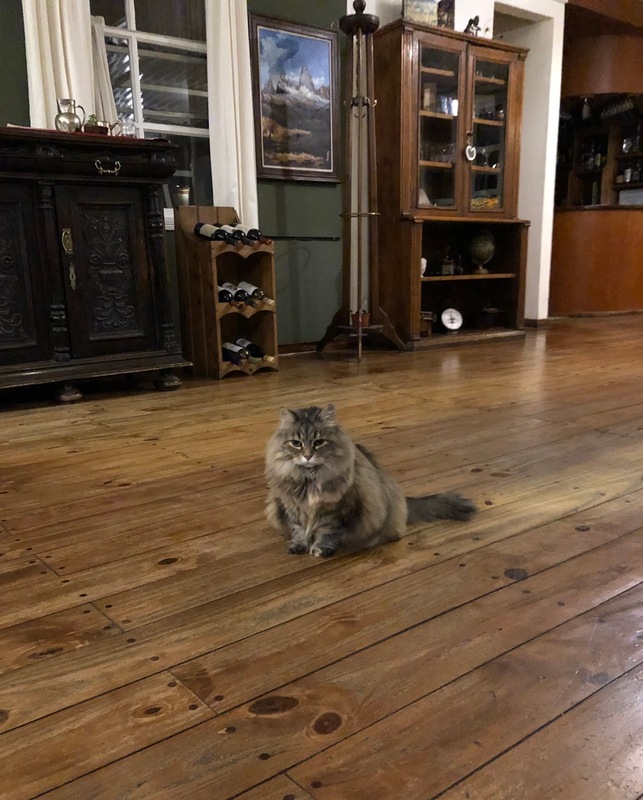 The fluffiest cat ever "Madame" Coca presented herself each night walking majestically as if to supervise the guests - as Guillermo said. She gets her name from a film actress and is elegant even when she lets herself fall to the old wooden floors in an unexpectedly swift movement to show her belly. On the comfortable cushions around the big fireplace, we drew the birds that we have seen with my daughter. The dinner was wine and trout and incredibly cozy. The following day, we walked the relatively easy 18 km trail Sendero Laguna Torre. Passing through small hills the trail ends at the Laguna Torre beneath the Glacier Torre. The majestic massif of rare beauty, the four granite towers, overlooks the lake. It is rare to see these towers without clouds we had been told: Cerro Terri, Torre Egger, Punta Herron and Cerro Mocho. In the afternoon, after resting in El Chaltén with backpackers sipping their beers, we returned to our lovely hosteria to have another cozy dinner and had some tea by the fire afterwards with Coca who was moving only slightly to go from one chair to another. 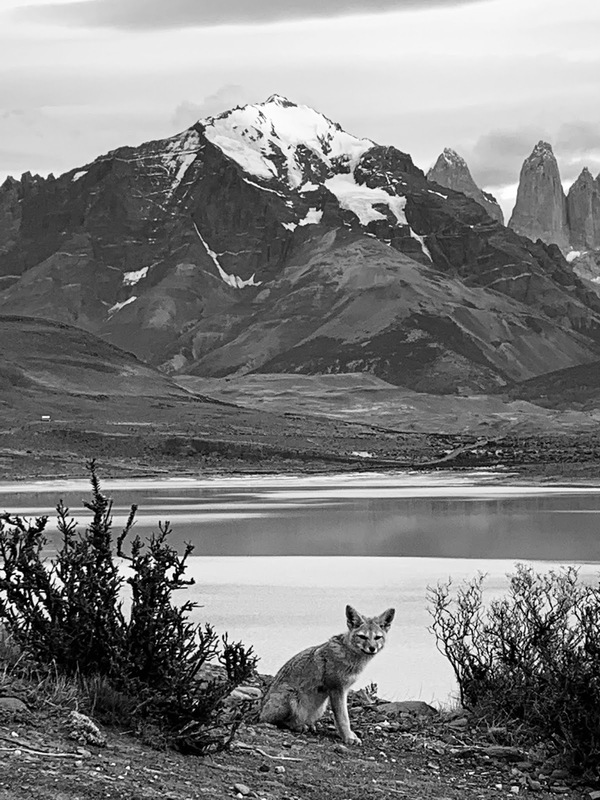 We woke up to a stormy morning which is typical for Patagonia for this time of the year. Most of the hotels would be closing for winter in a few days at the beginning of April. We left around 7:30. It was still dark. There was only one brave hiker starting at the trail head next to the hotel who would climb the Sendero Laguna de los Torres trail we did the other day with lots of others. We saw the sun rising on the vast lands creating short rainbows. On the way to El Calafate airport a few guanacos and rheas were taking it easy after the heavy rains of the night. After a three hours flight, we were back to Buenos Aires. In the afternoon lights we arrived at La Boca where you are not supposed to stay after dark. Colorful zinc shacks painted by the 19th and 20th century Genoese immigrants were lined alongside El Caminito. Ordinary buildings were decorated with graffiti. A group of men were playing music with large water bottles. A group of people including complaining kids were doing yoga on a sidewalk. In front of the stadium La Bombonera, policemen were gathering in large numbers. We learned later the the local football team La Boca was playing. In a short while, the tango music stopped, the stores closed their doors all at the same time and the streets were left to the stray dogs. 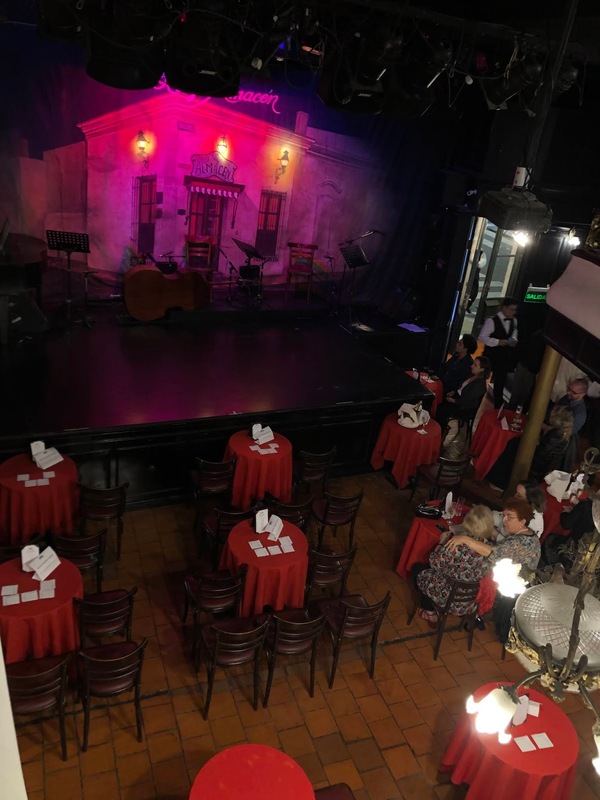 We finalized the night with a few tango performances on Plaza Derrago and El Viejo Almacen. In the morning, we went to Recolta where the upper class porteños moved after yellow fever broke out in San Telmo in 1871. We walked around the labyrinth-like streets of the Cementerio de la Recoleta seeking shade from the persistent sun. We then entered the cool marble interior of the luxurious Albert Palace Hotel with a pleasant glass-roofed L’Orangerie. Built in 1923 and known as the Paris of South America, the hotel serves to high-end customers like presidents and consulates. In Café la Biela, under the cool shade of ancient gum trees, we had café en jarrito con crema, chocolate a la Española and Imperial Lager Tanque Grande. Inside the café, there were black and white photos of the racing car drivers who used to hang out in this café during 1950’s. Outside the café in the plaza, Policia de la Cuidad and amateur tango dancers were conversing in the shade. Plaza San Martin was charming with a dark green park in the middle, and mansions of previous wealthy families. One was the Palacio San Martin built between 1905 and 1909 as the mansion of the Anchorena family, one of the landowners of Buenos Aires. 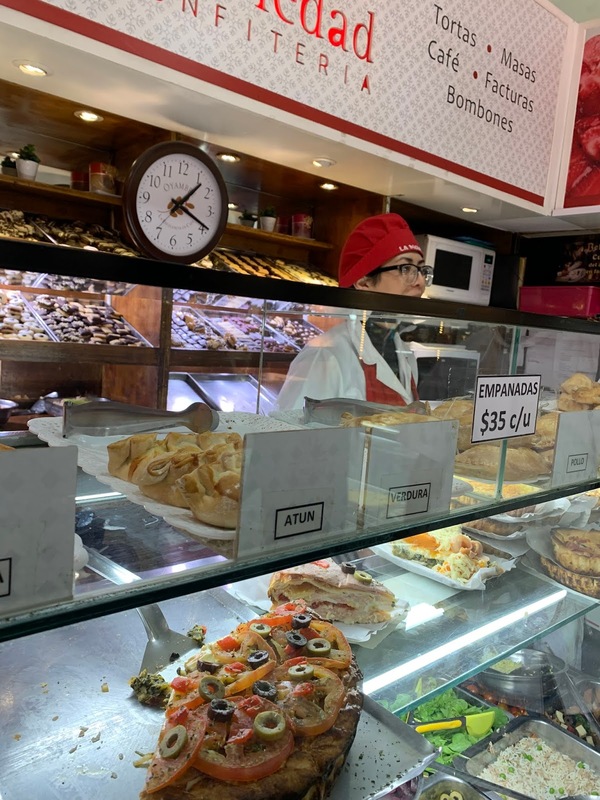 A narrow loud restaurant called El Banco Rojo was serving the best empanadas in town on 866 Bolivar, where we stopped by in order to avoid the plane food. We then had open sandwiches at Pan Pan in the Mercado Centormo listening to some of the most famous operas sang by two women. And the big finale was in Plaza de Derrago together with a last tango.